One of the real pleasures of having a greenhouse is escaping those cold gloomy winter days into your own little tropical paradise. This morning I escaped to Brazil thanks to Sophronitis cernua. I had the pleasure of seeing this species in the wild on our last school expedition to the Brazilian costal forest (Mata Atlantica) in 2006. It grows in dryish forest at around 800m altitude and so we grow it with a minimum temperature of 15 degrees Celcius. As you can see from the plant photograph we grow it mounted rather than in a pot. About nine years ago we tied a seedling to a piece of cork and as you can see the plant has grown to completely cover the mount. This year it is flowering really well. This species is pollinated by humming birds. No not the snow, Dendrobium wattii. Some orchids have the most amazingly crisp white flowers and this Christmas the best white is this stunning Dendrobium native to the Eastern Himalayas of Burma, Thailand and Laos. It is another cool grower and we keep it at a minimum of 10ºC. The orange stripes on the lip are guides to the pollinating bees although this may well be a deceipt poliator as are many long lasting orchids. The flower provides no pollinator reward such as nectar and relies on mimicry or naive pollinators. Research has shown that the closely related species Dendrobium infundibulum mimics a white Rhododendron species. Well, trick flower or not, Dendrobium wattii has won me over. 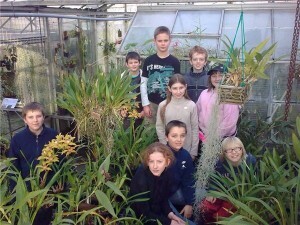 Writhlington School may be closed for the holiday but the plants in the school greenhouses never take a break. In fact, christmas is a lovely time with lots of plants flowering in the run up to our peak time in March. Most of the plants we grow are cooler growing orchids native to the tropical slopes of mountains like the Himilayas or Andes. The majority of these species flower in the dry season (winter and spring). The current impact plants in our cool end (minimum 7-10 degrees celcius)are the Mexican Laelias. Lealia anceps is native to the mountains in South West Mexico where they grow on oak trees. With us they flower reliably every christmas with long sprays of bright pink flowers. We find the species is easy to growand flower. In Mexico it is used as a central part of the Day of the Dead (El Dia de los Muertos) celebrations. Whether you celebrate El Dia de los Muertos or not, we recommend you have a try at growing Laelia anceps. Everyone at greenhouse club would like to wish you all a very Merry Christmas! We’ve had an excellent year and look forward to the next one, which will be full of even more Orchids, Conservation, Enterprise and a whole lot of fun! 1 Comment on The Big Bang! So, I hear you ask, what has ‘The Big Bang’ got to do with orchids? Well, not a great deal… the Big Bang Science fair in Manchester, though? That’s a whole other story! As some of you may already know, as part of our Sikkim expedition in April this year, I carried out research on the orchid populations of the Sikkim Himalaya. My research shows that the populations are now growing at a higher altitude than they did in the 1890’s and the altitude rise is in line with that to be expected from global warming. This project, as well as many others, will be on display at The Big Bang in Manchester Central from 11th – 13th March 2010. 80 days to go!